Natural Facial Rejuvenation depends on selecting the best techniques to correct the natural signs of aging. 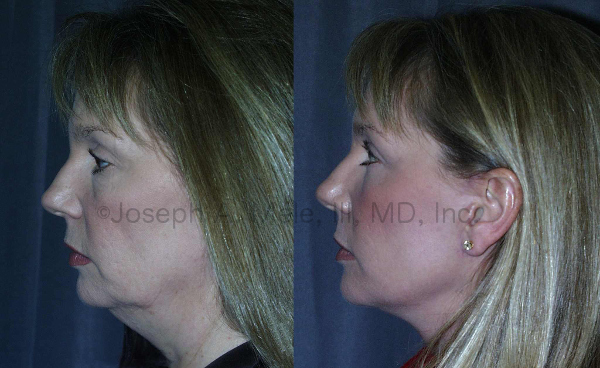 The Neck Lift is usually combined with the Face Lift to maintain facial harmony, as is shown in the before and after pictures shown above. Plastic Surgeons and Facial Plastic Surgeons alike have for decades debated the benefits of opened and closed approaches for Facial Rejuvenation. Most often, open vs. closed is debated for Rhinoplasty (Cosmetic Nasal Surgery), but at the most recent American Society for Aesthetic Plastic Surgery meeting in Las Vegas, the open vs. closed debate centered around Neck Lifts. The Annual Aesthetic Meeting attracts thousands of Cosmetic Plastic Surgeons from around the world. The American Society for Aesthetic Plastic Surgery (ASAPS) is over 2600 Plastic Surgeons strong. Most members are from the United States and Canada, but many countries are represented. Only about one-quarter of all American Board of Plastic Surgery certified surgeons have been accepted as ASAPS members. The ASAPS is the largest plastic surgery society dedicated exclusively to the Cosmetic side of Plastic Surgery. Most members, like myself, are also members of the American Society of Plastic Surgeons (ASPS). The ASPS represents both cosmetic and reconstructive plastic surgeons and has over 8000 members. The ASPS represents about 94% of all Board Certified Plastic Surgeons in the United States. The nice thing about a society dedicated to just the aesthetic aspects of plastic surgery is that we can focus on Cosmetic Surgery. There are many scientific sessions, expert panels and instructional courses offered over the week long meeting, each dedicated to a specific aspect of what Plastic Surgeons do. Every procedure is covered, often with multiple sessions exploring every aspect of every technique. Since there is often more than one way to do each procedure, lively debates are common, and some of these debates have been going on since long before I started my San Francisco Bay Area Plastic Surgery practice. One such on going debate explores the various approaches to Neck Rejuvenation. Neck Lifts seem easy enough, but they are one of the more challenging areas to correct. Just about everyone over 40 has tried lifting their neck at least once or twice in the mirror, but making the change long lasting, without distortion, is the challenge. Several Neck Lift techniques exists, but they are usually divided into two main groupings – Closed Neck Lifts and Open Neck Lifts. There is a tremendous amount of crossover between Neck Lifts and Face Lifts, and since the face and neck age together, the Neck Lift and Face Lift are usually combined to maintain facial proportions and harmony. The term Rhytidectomy (literally wrinkle removal) is used for Neck Lifts, Face Lifts and even Brow Lifts. When the neck has loose skin without platysmal bands, a Closed Neck Lift may be the best option. If disproportionate fat is present, Liposuction can be used to sculpt an even smoother contour. Closed Neck Lifts are similar to what we do in the mirror. The skin is tightened in the direction of the jaw line, and the excess is removed to hold the smoothed skin in place. This reduces the loose skin under the chin (the waddle or turkey gobbler), reduces jowls and better defines the junction between the face and neck. For closed neck lifts, the skin is opened around the ears like for a Facelift, but the neck is left closed. The platysma is a flat muscle that supports the neck skin. Often it is separated in the midline. As we age, we see this separation as Platysmal Bands, the two cords running down the front of the neck. One goal of the Neck Lift is to diminish to appearance of these bands. Open Neck Lifts do everything a closed neck lift does, but also include an incision under the chin. The opening allows for direct adjustment of the superficial fat and muscles under the chin and down the front of the neck. When platysmal bands are present, the two cords of skin that run from under the chin down the front of the neck, they can be “repaired” through an open technique. Excess fat can also be removed, and we Plastic Surgeons debate how much and from which levels fat removal is most effective, yet still safe and predictable. I add a third class of Neck Lift to my treatment algorithm: the Open-But-Just-A-Little-Bit Neck Lift. This is a combination of a Closed Neck Lift with Liposuction of the neck. It can accomplish much of the fat removal of the open technique through a much smaller incision. When disproportionate fat is present beneath the chin, Liposuction can be a useful adjunct to tightening up the skin. In this case a small incision is made under the chin to allow the fat to be suctioned, but not big enough to look through or repair the platysma muscle. In our yearly ASAPS debates, Plastic Surgeons choose techniques and debate the pros and cons, but in reality most of us use multiple techniques. The choice depends on what our patients need. This month I have used techniques from all three categories of Neck Lifts listed above. I choose different techniques for different patients depending on what is broken, and what I have to fix. If you are considering a Neck Lift, it is helpful to have an idea of what your options are. Some problems respond better to specific techniques. If loose skin is the main problem, a closed technique may be the best. Platysmal bands may respond better to an open technique, while disproportionate fat may respond to liposuction. The Internet provides lots of information, but trying to choose your own technique is a bit like trying to pick the wrench your plumber is going to use. Get a working knowledge of what is possible and get the help of a professional. Choosing the best Board Certified Plastic Surgeon is much more important than choosing the best technique. Getting multiple opinions can help, but you will likely learn that multiple approaches are possible. Having multiple choices can be a source of confusion, and this is why you need the best Plastic Surgeon. If you are in the greater San Francisco Bay Area, and would like to come into my Walnut Creek, CA, office for a Neck Lift evaluation, give me a call at (925) 943-6353. During your private consultation we will review your expectations and explore your options, so that the best Neck Lift for you can be selected.